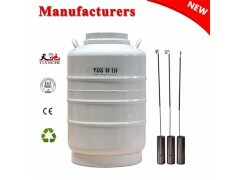 Vacuum Tank 80L is a kind of product used for cryopreservation at low temperature. It is used for static storage of indoor liquid nitrogen. It is an indispensable product in animal husbandry animal preservation, medical beauty, research institutes and other industries. This series of liquid nitrogen tanks has a core patented liquid nitrogen tank production technology, has applied for a number of design patents, products have passed European CE/RoHs certification, and all products have passed the performance test of the product quality supervision and inspection institute. Tianchi series liquid nitrogen container are commonly used for long-term cryogenic storage and transportation of liquid nitrogen refrigerants for livestock freezing and vaccines, cells, and microorganisms. They are widely used in animal husbandry bureaus, farms, universities, research institutes, national defense, and machinery. Electronics, metallurgy, energy and other industries have repeatedly won bids for liquid nitrogen tanks in many domestic university laboratories. At present, they have become the manufacturing base for liquid nitrogen cans in Chinese laboratories. 1.The Vacuum Tank has the advantages of long service life, small occupation area, compact structure, centralized control and convenient operation.